'Exactly 50 years ago, the range 02 marked the beginning of an era of success for BMW. This compact coupe is one of the vehicles that made the brand what it is today, "explains Adrian van Hooydonk, Senior Vice President BMW Group Design. The 2002 was placed at the top of its range and was the first European car produced in series with turbo technology. This coupe ended up becoming a genuine sports car. On the other hand, the 2002 Turbo represented the cutting edge of technology in engine development at BMW. The BMW Hommage 2002 is our tribute to the achievements of that model '. The attractive design of the 2002 BMW Hommage uses dynamic ways to achieve a single view of what is, for me, one of the most iconic vehicles in the history of BMW, says Karim Habib, Head of BMW Automobile Design. 'At the same time, synthesizes the victories of BMW motorsport, that were possible thanks to turbo technology. 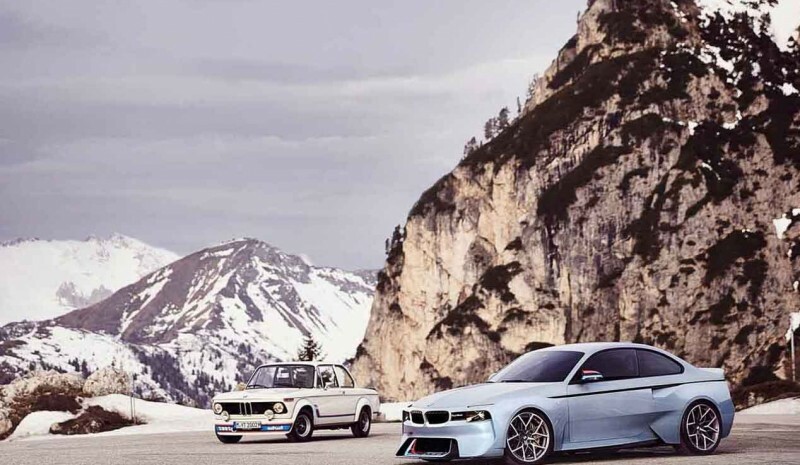 Thus, the Hommage unites the past and future of BMW in a confident statement of purity and driving enjoyment '. 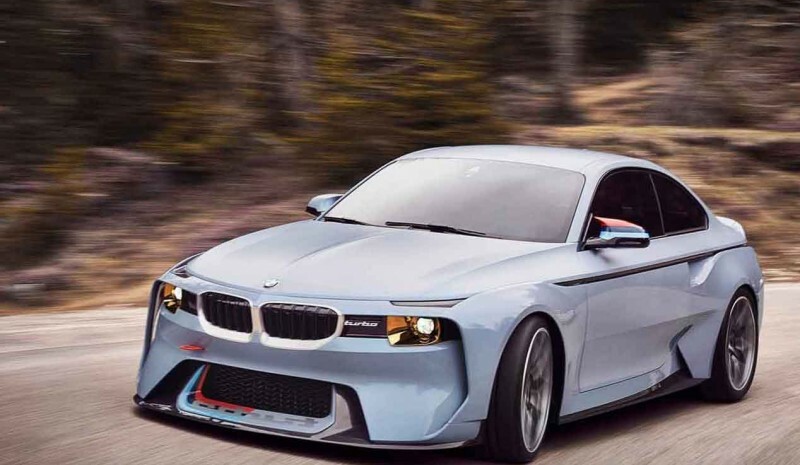 The sporty silhouette of the BMW Hommage 2002 results in a little car that rises above the asphalt. Its compact proportions, coupled with a long wheelbase, short overhangs and a prominent 'shark nose' promise driving experience, with its irresistible dynamism and agility, will thrill those who drive. Aerodynamic details like Large front and rear spoilers collaborate with generous air intakes to achieve a truly low drag coefficient. A horizontal strip carbon surrounds the body Hommade 2002, very similar to that decorated the same way in 2002. This line visually divides the car two distinct sections. The top of the roof, hood and tailgate carry matt paint to prevent the reflection of sunlight, mode racing cars of yesteryear. It is a stark contrast to this part with the lower section, with glossy paint, very sculptured surfaces and lines that give the sidewalls a contemporary taste and direct the eye towards the rear wheels. In both sections, the Space Race finish Metal gives a metallic blue tone moves a fluorescent blue shade to gray, depending on the light incidence, and it gives a sense of depth. In short, it is a design that gives off power and energy. Another visual appeal of the car are voluminous wheel arches, that give character and muscles. There is also here reminiscent of the 2002 Turbo, I needed widened wheel arches in the body to adapt to a width of fairly broad way. The alloy wheels 20 inches with a color design image reinforce. Finishing frontal 2002 BMW Hommage traces a bridge over the 50 years that separate the two models combining elements 02 range with design features that define the brand today. 2002 Hommage shows a tilted grill with black double bars. 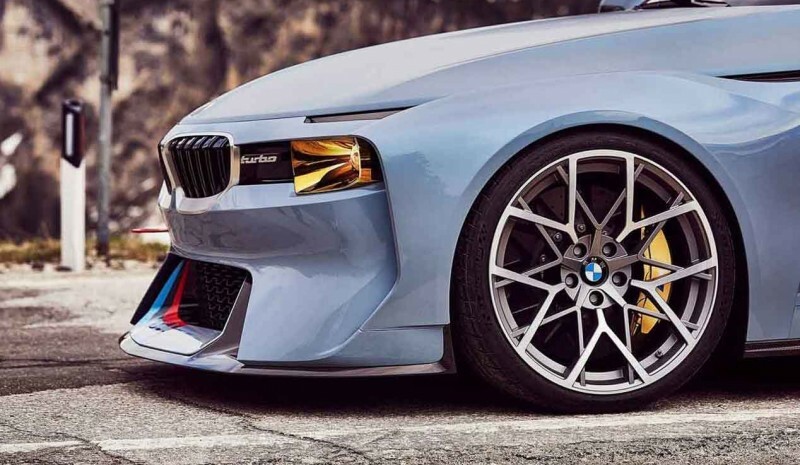 As in the legendary model, BMW headlights 2002 Hommage appear isolated. They are surrounded by reflectors whose golden color evokes the 50 years 'golden' celebrated with this car. A black line crosses horizontally the nose, and in her grill and headlights are housed, also emphasizing the width of the car and athletic plant. You may have noticed that direction indicators They do not look anywhere: they are separate headlights and hidden in the lines above each one. Fresh interpretation of the 2002 BMW takes the form of a car compact sports car in the line of the classical tradition of cars BMW Hommage. 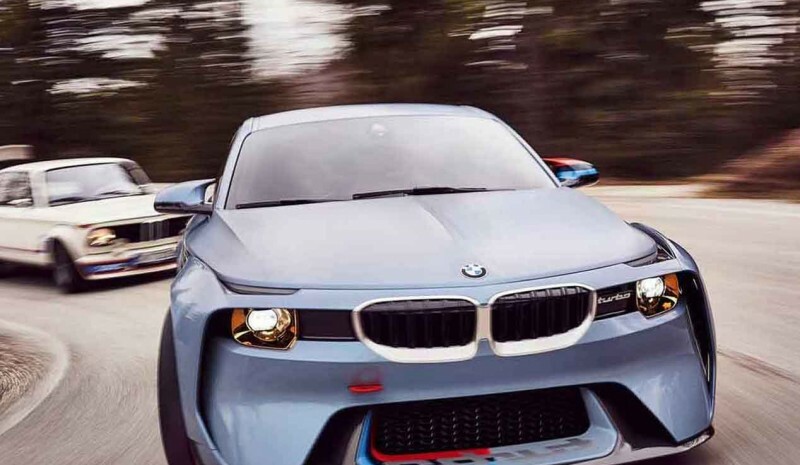 But it is more, the 2002 BMW Hommage represents a statement of how pure driving pleasure defined in 2016.